Making the world laugh for over 25 years. 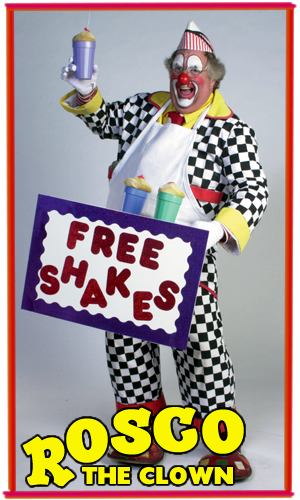 When you need a REAL clown for an upcoming birthday party, company party, picnic, or for any other reason, you need to call Rosco. Over the past two decades Rosco the Clown and his family-friendly magic, hilarious jokes, quick wit, and expert balloon sculpting has promoted wiggling and giggling at hundreds of events throughout the Midwest. "You have such a marvelous way with the youngsters (and fans of all ages!). It is just delightful to watch their eyes in total wonder ..."
-The Mt. Clemens Art Fair Over 400 shows per year! Call Rosco today to make your next party special! Browse, comment, rate and follow Rosco!! !